In order to maintain traction and avoid skidding, accelerate and decelerate slowly. Remember, everything takes longer when there's snow and ice on the road, so don't rush. A normal stopping distance on dry pavement is three to four seconds but, on icy surfaces, that should be increased to a minimum of eight to ten seconds. The best winter driving advice is to stay home. If you don't really need to leave, don't. Even if you're a competent winter driver, not everyone else on the road is. It's just not worth the risk. If you have any questions or need to get your car ready for a holiday trip, feel free to give us a call or schedule an appointment online. We're here to keep you on your merry way! 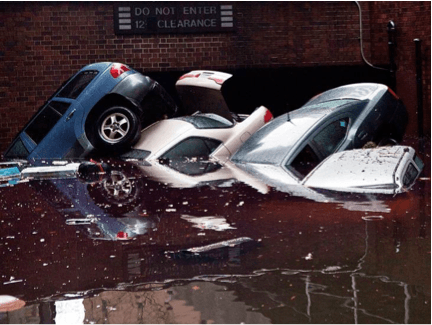 In addition to the wrecked homes and businesses, the floodwaters of Hurricane Sandy left thousands of submerged and damaged cars in her wake. Whether you were personally affected by the storm or not, it's important for every car owner to know how to deal with a waterlogged car. The first thing you should do after your car is flooded is to assess how high the water got and what type of water it was. This will tell you whether your vehicle is salvageable or not. If the water line is above the dashboard, you should probably wait for the adjuster or take it to a professional. It's feasible to clean the mechanical elements and interior of the car yourself, but the electrical components are more complex and require professional attention. Also, if your car was flooded by salt water, it's better to take it to a trained mechanic. For cars that weren't completely submerged, don't wait for the adjuster to arrive. Floodwater is highly corrosive, and the longer it sits the more damage will occur. Start by cleaning out as much of the mud and water as possible, drying everything out as you go. Do NOT attempt to start the car at this point. If there is water in the engine, transmission, or fuel system, you will cause irreparable damage. To determine if this is the case, check the dipsticks for the engine and transmission. If water droplets cling to either end, you absolutely have to change the oil and filter before you start the engine. If the water was muddy, you might also want to remove the oil pan from the engine and wash it off. Change the oils again after a few hundred miles. Additionally, water can infiltrate the engine seals (crankshaft seals, transmission seals, axle & CV joint seals). Again, check the dipsticks for water and then change the oil, transmission fluid, and drive lube. In the event of a flood, it's better to dry out the car as much as possible while waiting for professional help to prevent further damage. If you have any questions, or need help with a water-damaged car, feel free to give us a call or schedule an appointment online. We wish you a happy, safe, and dry holiday season!